This article is on church architecture. For a general description and the theology of the Church, see Orthodox Church and Ecclesiology. The word church is derived through Middle and Old English cirice, circe from the Koine Greek: κυριακον (Greek: δωμα) Lord's (house). However, most English versions of the New Testament use the word church to translate ecclesia (Koine Greek: εκκλησία) "congregation, assembly", a word originally used without specific reference to religious gatherings. 3 Church building as an icon of the Church. a building for public Christian worship. collectively, the whole body of Christ's followers. public worship - a religious service. a body of Christian believers of the same creed, rites, and ecclesiastical authority. ecclesiastical power as distinguished from secular. the clergy; the clerical profession. of or pertaining to the church. performance a church service or ceremony for or with a person - as for a woman after giving birth. having to do with organized Christian worship. In everyday use church refers, most often, to the building in which the local Christian congregation meets for worship. The building can be large or small. In the immediate years after Pentecost the new Christians met at the Temple and synagogues. After the destruction of the Temple and dispersion of the Christians, the followers of Christ met in private homes for their assemblies for divine services. After Constantine issued the Edict of Milan, larger buildings began to be built specifically for worship as the need to avoid attention disappeared. Churches have been built in a variety of shapes. The usual local Orthodox parish church is a rectangular building. At one end, by tradition facing east, is the bema with the altar located on it. This area is usually separated from the nave by an altar screen (iconostasis) and/or chancel rail. Behind this separation is the altar table. By ancient tradition the nave may have benches lining the walls, but otherwise the church is without seats or chairs. At the west end there may be a room running the width of the church called the narthex. The narthex is separated from the nave by a wall with doors through which the congregations can enter the nave. Other common styles of architecture for churches including Basilicas (Early Christian Church buildings with side aisles to the nave), octagonal shapes, square buildings, circular buildings, and buildings in the form of a cross. To create a high vaulted ceiling many churches have domed ceilings and may have bell towers either as part of the main building or separate free standing structures. In time, churches that were the bishop's church came to be called cathedrals, named after the bishop's seat, called the cathedra. Also, a class of building, or a room or space in a larger building or church, came to be called chapels. Often the main or largest church, especially in monasteries, is called a katholikon. Church building as an icon of the Church. Orthodox Church buildings are full of icons, but the very architecture and layout of the buildings are themselves icons of the Church. In the ornamentation of the church, the various iconographical scenes and figures are not arranged by chance, but according to a definite theological scheme, so that the whole edifice forms one great image of the Kingdom of God. The Orthodox faithful can feel the building open up to a time without end. They are surrounded by the images of Christ, the angels, and the saints, and are reminded of the invisible presence of the whole community of heaven at the Liturgy. Each local congregation, in their church building, can see that their Liturgy on earth is one and the same with the great Liturgy of heaven. The building should help the faithful lay aside their earthly cares, as the Liturgy is celebrated, so that they, like the cherubim, may welcome the king of all (see Cherubic Hymn). The building should also reveal a basic understanding of Orthodox Christianity that God is with us. The design shows that God is with men, dwelling in us and living in us through Christ and the Spirit. By having a dome or the vaulted ceiling, many Orthodox churches have the impression that in the Kingdom of God, Christ "unites all things in himself, things in heaven and things on earth," (Ephesians 1:10) and that in him we are all "filled with all the fullness of God." (Ephesians 3:19) This dome symbolism is in contrast to pointed arches which point to God far up in the heavens. A church is not constructed simply to be a meeting hall for men whose life exists solely within the bounds of this earth. The church building is patterned after the image of God's Kingdom in the Book of Revelation. 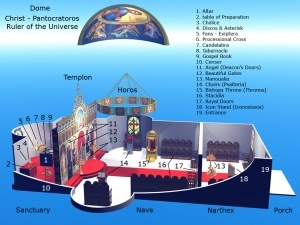 The Narthex-vestibule symbolizes this world. Services such as those for baptism or wedding services start in the vestibule. The Nave is the place of the assembled people of God. The faithful Christians on earth who already belong to the holy assembly enter into the eternal worship of God's Kingdom in the Church. The Altar area stands for the Kingdom of God. The altar table is where Christ is enthroned, both as the Word of God in the Gospels and as the Lamb of God in the Eucharistic sacrifice. Around the table are the angels and saints in the perpetual adoration inspired by the Holy Spirit. This page was last edited on September 1, 2010, at 17:33. This page has been accessed 39,984 times.